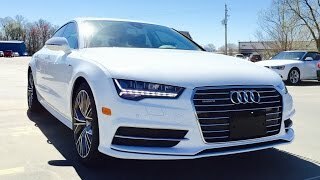 Audi didn’t leave any stone unturned, while redefining its Sportback and this is only why that we have this all new power packed Audi A7 Sportback 2015. Making debut in 2007 the A7 Sportback set new benchmarks for the automotive market through its elegant looks and features. 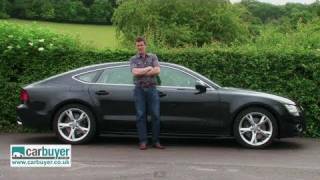 Let us have a look at the review of Audi A7 Sportback 2015 and get to know this model better. The interior of Audi A7 Sportback 2015 is highly sportive with its looks and features. Interior is made from aluminum and Valcona Leather featuring impressive finishing. To add some sportive behavior company has also amalgamated horizontal lines around the driver and passenger. There is also good range of tech based options inside the interior of Audi A7 Sportback 2015, queue begins with ventilated and massage providing seats and further taking the leap to the MMI radio navigation and a head-up-display that features all vital information. In the entire, interior is an impeccable touch of sportiness and luxury that you can expect from a company like Audi to bring up in this segment. The exterior of Audi A7 Sportback 2015 is made from premium quality steel grades and aluminum. The materials thus provide a lightweight body to Audi A7 Sportback 2015 that offers a base trunk capacity of 535 liters and with rear seats folded it increases to 1,390 liters. Apart from this the exterior also comes with some changes that begin with, Singleframe grille, front and rear bumpers with LED head and taillamps. Looking at the exterior of Audi A7 Sportback 2015 from side it gives a sloppy touch while the front and rear portray the sporty look keeping optimum amount of elegance. 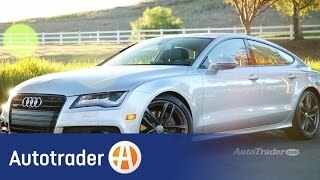 The Audi A7 Sportback 2015 rolls over four drivetrain options; First is the 3.0 TDI delivering 272 hp while the second is a 3.0 Liter V6 generating 218 hp. Third in the list of TDI engines is a 3.0 Liter biturbo producing maximum in the offered list with a 450 hp power and also uses cylinder on demand technology and this is achieved through a 4.0 Liter TFSI engine. 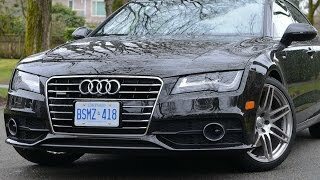 The last in this list of engines inside Audi A7 Sportback 2015 is a TDI with 3.0 Liter biturbo engine delivering total output of 320 hp and is paired to an eight-speed tiptronic transmission while the rest of the engines come with seven-speed S tronic transmission.